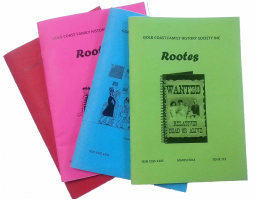 Rootes Journal - Gold Coast Family History Society Inc.
Our Editor, Beverley, is keen to accept contributions, articles and advertisements to the Journal. Don’t think members wouldn’t be interested in your story, be it big or small. Large contributions can be serialised. Please contact ​Beverley on 5535 8836 or by email. Is our quarterly magazine full of helpful hints and stories from our members. Our hardworking editor assembles a fascinating variety of articles for this quality publication of over 40 pages. No matter how long you have been researching it is worth a read. Rootes is posted quarterly to all members as part of their membership. The editor encourages all members to contribute articles for publication. Advertising is accepted at the following rates per quarter.